On May 16 and 17 Mecalac welcomed its dealers from the Americas: Canada, USA, Mexico, Colombia and Chile to its premises in Annecy-le-Vieux. Export development is one of the priorities for the French Mecalac Group, which has been designing, manufacturing and selling machines dedicated to urban construction sites for more than 40 years. 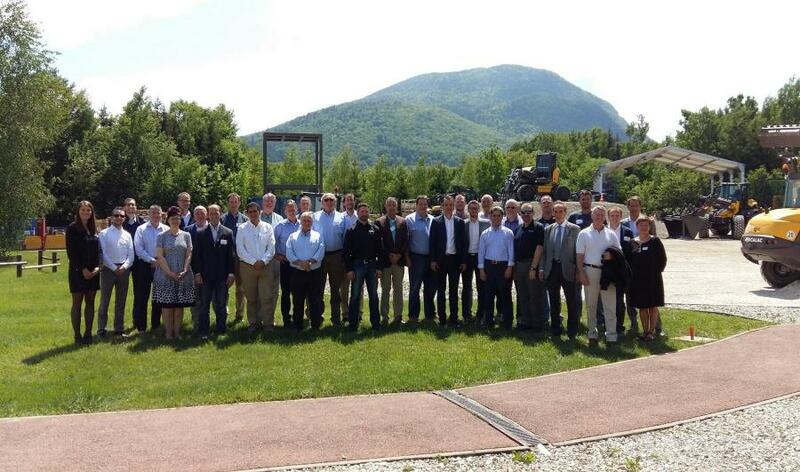 With this as a focus, on May 16 and 17 Mecalac welcomed its dealers from the Americas: Canada, USA, Mexico, Colombia and Chile to its premises in Annecy-le-Vieux. In 2016, Mecalac North America, a new commercial subsidiary of the Mecalac Group, was established and the first dealer LHE in Boston launched the sale of Mecalac excavators from the MCR range of crawler skid excavators. From that time, the distribution network has been extended with the aim of maximum coverage of both North and South America. The sales have since extended to the entire group product range, from wheeled excavators and loaders to backhoe loaders, dumpers and compactors. The meeting with the American dealers in May gave the opportunity for each of them to visit the French factories where the excavators are made — the Albens factory to view mechanical welding and hydraulics and the Annecy-le-Vieux factory to see the machine assembly, as well as to meet their regular contacts within each of the departments. For Mecalac, this meeting was a pledge for the solid collaboration in markets with a potential to bring increased globalization to the group. For more information, visit www.mecalac.com/en/.